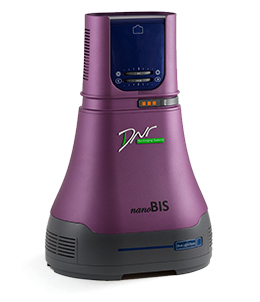 The nanoBIS is a compact, affordable, easy-to-use imaging system for stained gels. Equipped with a high-resolution scientific camera, the nanoBIS system can be used to image gels incorporating fluorescent stains (e.g., ethidium bromide and SYBR® stains) or colorimetric stains (Coomassie™ and silver stains). Each nanoBIS includes a camera hood and your choice of interchangeable bases: UV light Base or Blue light Base. For Colorimetric applications (such as Coomassie™ blue stain) you may use either the Blue Light Base or the UV Light Base in combination with the nanoBIS dedicated converter. Setup is simple, and the system features intuitive software for band analysis.